Action from a recent (red-shirted) Gala Fairydean Rovers game, against BSC Glasgow (picture by Alwyn Johnston). 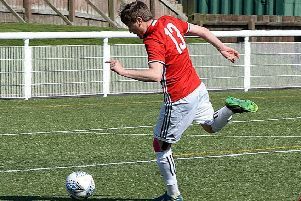 Gala Fairydean Rovers finally ended their eight-match search for a win in a drama-filled Saturday spectacle at Raydale Park. GFR, missing a huge number of first team players through injury, were forced to name only two substitutes; a trialist and manager Steven Noble. They produced a monumental performance to ensure a priceless three points travelled back up the A7. Gretna came out the blocks flying and their early pressure almost told, but Kevin Connelly’s angled drive from inside the box on six minutes came back off the right-hand post. This seemed to wake the visitors from their stupor and they took the lead just three minutes later, through an unlikely scorer. Scott Main took the ball on the left from Calum Riddell and played a one-two with Andrew Crawford, before driving into the box and putting a wonderful ball into Sean Guiney, who finished well on the half-volley from close range. On-loan Rangers goalkeeper Lewis Muir was called into action on 15 minutes and he delivered an excellent flying save to deny Kingsley Grandison from just inside the penalty area. Gala could have stretched their lead further after 22 minutes, with a slick counter attack almost setting Andrew Crawford free, but a Gretna body just managed to beat him to the ball and deflect it behind for a corner, which came to nothing. The match took an unlikely turn on 24 minutes. Gala were awarded an innocuous free kick on the halfway line, much to the annoyance of Gretna goalkeeper Johnny Jamieson, who was so frustrated he managed to earn himself two yellow cards in a matter of minutes, both for dissent towards the match officials. Scott Main fired over from 25 yards with half an hour gone in what would prove to be the last real action of the first half, and the buoyant visitors went into the break extremely pleased with themselves. Their satisfaction would be somewhat subdued eight minutes after the restart, as Gretna’s top scorer Kevin Connelly found himself with acres of space in the box and duly fired beyond a dejected Muir and into the left-hand corner. Gala FR should have regained the lead four minutes later, as Scott Main drove 30 yards down the left wing with the ball and played a wonderful ball to the advancing Riddell at the back post, but he just failed to squeeze the ball into the net from a tight angle a couple of yards out. They created an even better chance after 65 minutes – Andrew Crawford’s excellent cross was met by Grant Rose but his goal-bound strike was completely stopped in the mud of the penalty area, which was to be expected, as the pitch was rapidly deteriorating under pressure from both sets of players and the heavy rain, which had persisted throughout the game. Lewis Muir made another outstanding save with 67 minutes gone, flying acrobatically through the air to tip Grandison’s curling strike over the bar. He was forced into another fine stop to keep out Kevin Connelly’s powerful free kick. Gala made their only substitution of the game after 72 minutes, with trialist Fraser Malcolm coming off the bench to replace Calum Riddell. This would prove to be an inspired substitution from Steven Noble, as Gala took the lead under a minute after the change, with new boy Malcolm playing a key role. Billy Miller took the ball in midfield and drove forward well before releasing Grant Rose on the left flank. Rose made his way to the byline and beat his man well, before crossing to the back post, where the youngster acrobatically forced the ball into the net, sparking scenes of jubilation on the Gala FR bench. Gala FR: Muir, Guiney, Aitchison (c), Ainslie, Main, Crawford, Miller, Heugh, Rose, Paliczka, Riddell (Trialist 72).